The Fellowship was fortunate enough to obtain a copy of NEVER ENDING #1 from Dark Horse Comics. The story is by Adam P. Knave and D.J. 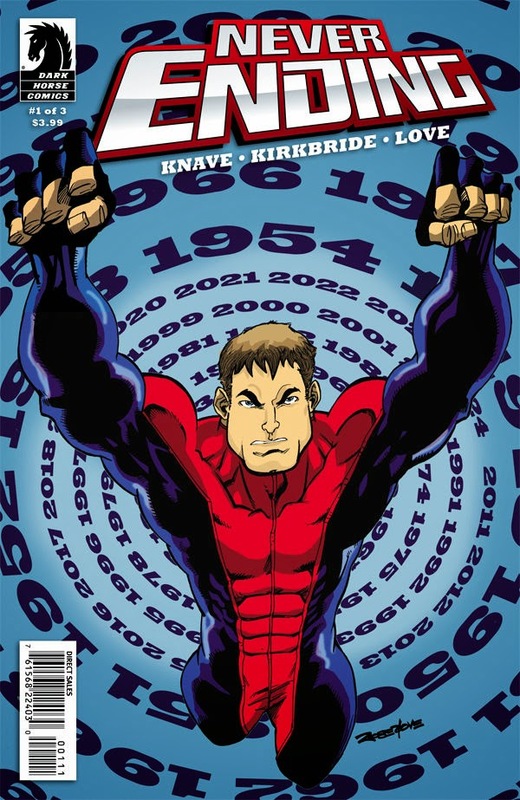 Kirkbride, with art by Robert Love, colors by Heather Breckel, and lettering by Frank Cvetkovic. Charles “Chuck” Baxter is just a regular service station attendant, until that day where a meteor crashed near him and gave him superhuman abilities, including immortality. With the help and love of his girlfriend Ellie Harrison, he becomes a hero. Over time Chuck realizes that was not a good thing, especially when scientist Archibald Crane who was brought in to help him becomes his enemy. While the subject of immortality in super hero books is not a new subject, I’m curious to see where Knave and Kirkbride go with this. There’s usually anger and grief, following going into hiding or isolation, but I can’t recall a hero wanting to be killed by their arch nemesis. They show a brief glimpse on why Archibald becomes Chuck’s worst foe, but it’ll be interesting to see what pushed him over the edge. I love looking at Robert Love’s art, it looks great. Check it out! NEVER ENDING #1 is in stores now, or available to order at www.Darkhorse.com.